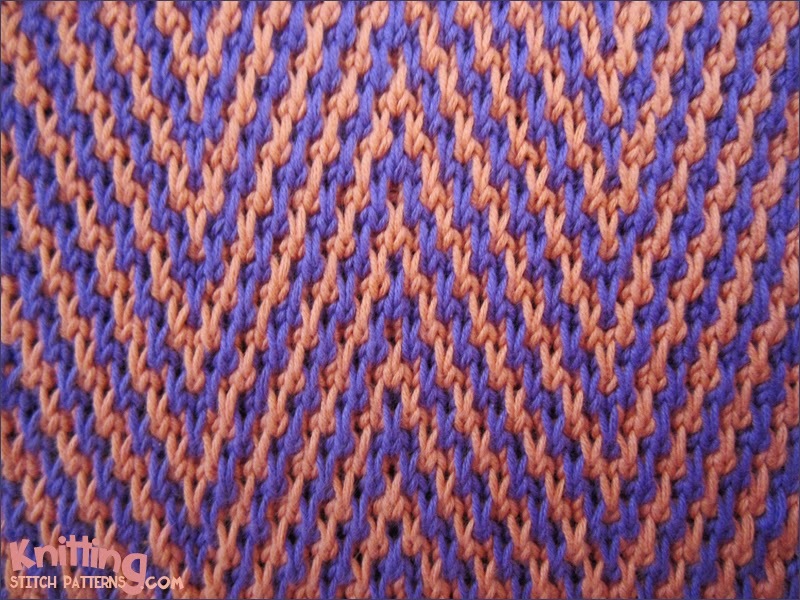 The Zebra Chevron stitch is a 12 row repeat and is knitted in a multiple of 24 stitches plus 2. Cast on with color A and purl one row. Row 1 (right side): With color B, k1, * sl 1 wyib, k2; repeat from * to last st, k1. Row 2: With color B, k1, * p2, sl 1 wyif; repeat from * to last st, k1. Row 3: With color A, k1, * k1, sl 1 wyib, (k2, sl 1 wyib) 3 times, k3, (sl 1 wyib, k2) 3 times, sl 1 wyib; repeat from * to last st, k1. Row 4: With color A, k1, * sl 1 wyif, (p2, sl 1 wyif) 3 times, p3, (sl 1 wyif, p2) 3 times, sl 1 wyif, p1; repeat from * to last st, k1. Row 5: With color B, k1, * k2, (sl 1 wyib, k2) 3 times, sl 1 wyib, k1, sl 1 wyib, (k2, sl 1 wyib) 3 times, k1; repeat from * to last st, k1. Row 6: With color B, k1, * p1, (sl 1 wyif, p2) 3 times, sl 1 wyif, p1, sl 1 wyif, (p2, sl 1 wyif) 3 times, p2; repeat from * to last st, k1. Row 7: With color A, k1, * sl 1 wyib, k2; repeat from * to last st, k1. Row 8: With color A, k1, * p2, sl 1 wyif; repeat from * to last st, k1. Row 9: With color B, k1, * k1, sl 1 wyib, (k2, sl 1 wyib) 3 times, k3, (sl 1 wyib, k2) 3 times, sl 1 wyib; repeat from * to last st, k1. Row 10: With color B, k1, * sl 1 wyif, (p2, sl 1 wyif) 3 times, p3, (sl 1 wyif, p2) 3 times, sl 1 wyif, p1; repeat from * to last st, k1. Row 11: With color A, k1, * k2, (sl 1 wyib, k2) 3 times, sl 1 wyib, k1, sl 1 wyib, (k2, sl 1 wyib) 3 times, k1; repeat from * to last st, k1. Row 12: With color A, k1, * p1, (sl 1 wyif, p2) 3 times, sl 1 wyif, p1, sl 1 wyif, (p2, sl 1 wyif) 3 times, p2; repeat from * to last st, k1.